If you want to uncover one of the most shocking prophetic discoveries of this century then this is the most important letter you'll ever read this year! You see, locked away in a 2,500-year-old Bible prophecy are some amazing revelations that predicted the invention of the computer you're using right now ... and more! ....Do you think that the Internet came about by chance? Think again. This same prophecy predicted the Internet you're using right now. ....You're about to experience some hair-raising and amazing truths that you've simply never heard before. And the facts are so plain to see you simply cannot deny them. It doesn't matter where you are on the spectrum of belief. In fact, the most common reaction I get from countless readers is, "WOW!" ....As a student and teacher of the Bible for over 25 years, I've done thousands of presentations and still today people identify me by the discoveries you're about to experience for yourself. My audiences just cannot forget these piercing truths and you won't either! ....In fact, I dare you to put this book down once you open the covers. In just about 102 pages you'll be taken through the centuries-old prophecy step-by-step and no prior Bible knowledge is required. Have To Do With Soda Cans? What you're about to discover will literally amaze you because you'll see that the Bible knows (and predicted) more about our times than you ever thought - down to the very type of soda cans you'll drink from! ...When I first started to share this information the picture was still cloudy. Over the past 10 years I've seen the prediction come clearer and clearer. I mean, you'll have to be blind not to see the fulfillment. When you get this book if it doesn't leave you with your mouth wide open, then you need to read it again - you didn't get it the first time. .....This 2,500-year old prophecy has been commented on and studied for hundreds of years, but none imagined that it could say so much. You'll have a chance to weigh the evidences for yourself and come to your own decision. But you'll never look at the world quite the same again. ....Having conducted many Prophecy Seminars in the Caribbean and the United States, I know how much these amazing discoveries have been appreciated by my audiences - and for very good reasons. Did the Bible predict the rise of Bill Gates as the richest man in the world? How could I have benefited in the same way if I knew this prophecy before? What did the Bible predict about your kitchen utensils and the car you will drive? This will be a total shocker as you see how much you are surrounded by this fulfilled prophecy. Did the Bible predict the airplane and flight? The answer will surely surprise you. How this amazing prophecy can help even in your business investment decisions. Stay ahead of the stock markets! One of the most misunderstood prophecies and how it can be explained. Find out what the Left Behind Series forgot to tell you. What is the real future of the United Nations and the European Common Market. What does the prophecy say about the new Euro dollar venture. Will terrorist dominate the world? Are we fighting a losing battle? How will this world really end? Are these really the "end times" or is there really such thing as the "end times"? So many in centuries past have preached that their days were the last days and history marhes on. How could they've been so wrong? "I have one thing to say -> "WOW!" I couldn't have put your book down("Did the Bible Predict the Internet") if I wanted to..."
"Ray Edwards has brought some extraordinary new light to one of the oldest prophecies of the bible - and reveals startling new evidence that applies ancient predictions to modern times. 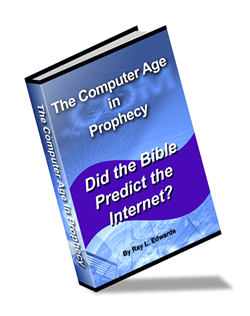 "Did the Bible Predict the Internet?" is a must have for any serious student of the bible, yet it's written simply and clearly enough for anyone to gain a good understanding of how the bible applies to modern times." "I have never read an eBook that was over 20 pages long at one sitting --before today. I wanted to let you know that your book is well-written and makes its case very clearly and logically. I also appreciate your careful handling of prophecy. There was no "sensationalism" in it -- it was carefully done and quite thought-provoking." You'll be taken step by step through the prophecy, comparing history with the predictions. This is no "... well the Bible says in the last days knowledge shall increase" answer. If it were that simple I would not invest so many hours of research to get this material in your hands--and almost every Bible reader knows that already. You have NEVER heard or read this before and you'll not find this any other place than in this book ... PERIOD! .....I'm so confident that what I'm about to share with you will be so NEW and exciting that if you think otherwise I'm happy to pay you twice what you invested in the book. This is no empty promise. "WOW, Ray I am really impressed. Your ebook has me so interested that I just cannot put it down - or rather, turn it off." Whether you agree with his findings or not, you will agree he makes a powerful case for his work." .....Because I wanted to get this thought-provoking SECRET into your hands as quickly as possible, I've deliberately slashed the price to a minimum investment. There's no way that I would want a price to come between you and this incredible piece of revelation. So for this special launch you get The Computer Age In Prophecy for just $14.97 $9.97.